First of all, thank you to everyone not saying, “Please, please write! We want another book!” LOL Trust me, books are now about fifth place in my life. I have always intensely admired Jean Auel for putting some 17 years between books in her Clan of the Cave Bear series. I am living life for me, and not for what others want of me. Having said that, there is a project I am very enthused about … if only I can get away from the garden long enough to write it. But that won’t be for a while yet. Today has been an intensely lazy day. I have pottered – doing a little weeding, sighing over the fact that the bramble I thought I had rooted out is now back, transplanting two russel lupins, watering pinking solution into the hydrangeas (two months too late! ), and forwarding all my clocks an hour as tonight we begin daylight savings – so I am already in daylight savings mode, which means I get an extra hour out in the garden today! Yay! That’s as well, because having potted, and not feeling like getting stuck into any serious work, I hauled out my “left over grocery shopping money” tin and had a look inside, found $50, so took myself and the $50 off down to the local plant nursery to see what I could buy with it. They had been going to buy me some more bamboo wigwams for my peas, but they weren’t in, so, shucks, I had to get some plants instead. 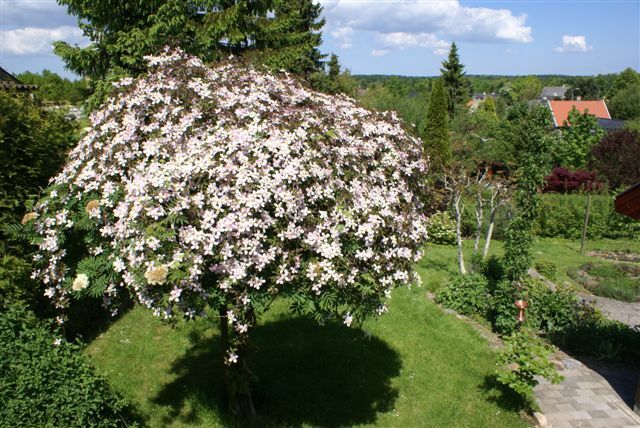 I bought a clematis Montana Rubens (the link shows one growing over a small tree). I love this clematis. Most of the clematis you see about now are the modern hybrids that grow to about 2 metres high and produce spectacularly huge and vivid flowers. They are lovely, but I prefer the old stock – like the Montana Rubens. They grow to about 10 metres in whatever direction they can, and in mid-spring produce the most spectacular show of little pink flowers, spot flowering all through summer – but for about a week they are breathtaking. I already have three of these clematis growing over the iron work of my veranda – this new one will be destined to grow over one of the cat enclosures. People think I like cats. Not so. I have cats because that means I have an excuse for cat enclosures. If I have cat enclosures then it means I have fantastic mesh frameworks for things like the Montana Rubens to scramble over. The enclosure this one is destined for already has wisteria and a climbing rose attached to it, and I am sure I can squeeze in the clematis! I also bought a little container of hollyhock seedlings. I love hollyhocks but I have no idea why I bought these. 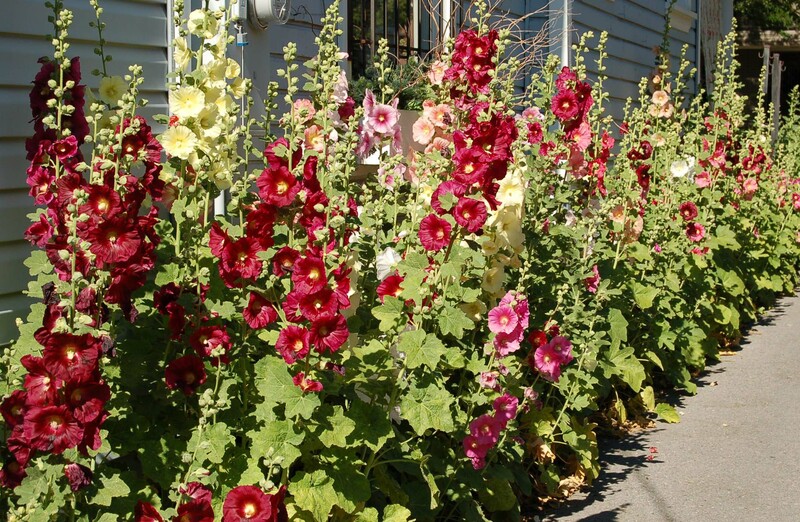 Hollyhocks are difficult to grow in my garden because of the huge winds I get here. They’ll get to about 2 metres high, start to flower spectacularly, then they’ll be snapped over and dead the next day. Finally, I bought 3 largish tubs of garden variety (sorry!) hostas. I know I wasn’t going to get any until next year but these just threw themselves in my carry basket and begged to come home with me. Really. I had no choice. Here is a link to 3 varieties – the lot I have are like the central kind. Also, today, I stood about in the front garden and thought to myself, Finally! The front bog garden has taken a long, long time to come together. It is now into its third spring-summer, and finally it has self sown enough to a) blot out most weeds and b) start to show some of its promise. In about five years it will be breath-taking (I really hope I am about to see it then). In a couple of weeks I will start to take a series of photos of it – maybe I will start tomorrow although nothing is flowering yet. The front garden was the part of my garden to suffer the most when I was ill for a year – it was smothered with weeds, yet somehow all the basic plants survived all the neglect and, now mostly weed free (save for that bloody bramble), they are starting to truly establish themselves. I think I might go plant out that clematis. The sign of a true gardener when the grocery money goes on plants! Before and after photos are wonderful. Your photos really show all of your hard work over the past number of years. And, I agree that it takes about five years for a “patch” of garden to really start to fill in and self-seed nicely. I admit to envying your gardening season firing up whilst my season is winding down! Sara, I must admit to wondering when your next book would be written, but I do believe your connection to the earth through your work in your garden is the most positive thing you can be doing for yourself right now, and whatever is going to keep you strong in body and soul is good for us, your dedicated fans. I am thoroughly enjoying your garden blog and I thank-you for sharing.